I accept the ACHRP Terms & Conditions of use. 1) Are you accredited by IHRM to offer CPD trainings? Yes we are an accredited HR Firm Reg. No. C00259. All our workshops are approved and earn participants Continuous Professional Development (CPD) points. To view the IHRM approval for CPD, please click the Course Code for each training listed under Take Courses menu in your account. 2) Are you a Registered NITA Training Provider? Yes we are registered by NITA. Our registration number is NITA/TRN/1234. All our trainings costs are NITA reimbursable. For your company to be reimbursed it ought to have sought NITA approval for the training at least 7 days before the date of training. 3) How many workshops do you have in 2019? We have 5 CPD programs scheduled for 2019. 4) Where will the 2019 CPD workshops held? 5) How many CPD points does each 2019 workshop has? Each of the 5 2019 workshop is approved by IHRM for 2 CPD points. 6) How do I Sign In to the Learning Management System? Sign In to your account using the Sign In Form on the left side of the Home Page. NB: If you usually receive our emails enter your email and default password myachrp2018 to Sign In. If you don't have an account create one using the Registration Form on the right of the Home Page. 7) How do I register for courses? Go to the Take Courses menu. Select the course(s) by clicking inside the check box on the first column. Below is the legal notice for https://www.achrp.org (Hereinafter referred to as the “Site”, “Website” or the “Learning Management System”). This website is owned and operated by the Academy of Certified Human Resource Professionals Limited (Hereinafter referred to as “ACHRP” or “we”), on its own behalf. 1. If you are under 18 years of age, please be sure to read these terms and conditions with your parent or guardian and ask questions about things you do not understand. 2. These Terms and Conditions apply to your use of this website, its features and contents (“the Site”). Please read these Terms and Conditions carefully before using and/or registering on the Site because by accessing or using the Site or any mobile versions of it or by linking to it, you signify that you have read, understood and agreed to be bound by these Terms and Conditions. These Terms and Conditions are a legally binding agreement between you and us. 3. You are responsible for bringing these terms to the attention of anyone who may read material on this Site as a result of your access to it. 4. We reserve the right, at our sole discretion, to change, add or delete portions of the Terms and Conditions at any time. If we do this, we will post the changes to these Terms and Conditions on this page and will indicate at the top of this page the date these terms were last revised. We may send registered users and subscribers an email notifying you of the change. Your continued use of the Site after any such change whether or not you received an email from us notifying you of any changes, constitutes your acceptance of the new Terms and Conditions. If you do not agree to abide by these or any future Terms and Conditions, please do not use or access (or continue to use or access) the Site. 5. We reserve the right, at our sole discretion, to make any changes to the Site and levels of service offered and to terminate access at any time. 6. You must not use data mining, robots, scraping or similar data gathering or extraction methods on any part of this Site without our express prior written consent. 7. Please note that the usage and purchase terms and privacy policies of various ACHRP products and services within this Site or linked to this Site may be subject to more specific terms and policies. Please check those terms and policies frequently to determine the terms applicable to such ACHRP products and services. If there is a conflict between those more specific terms and conditions and these Terms and Conditions, then the more specific terms and conditions will apply. 1. All materials on or available through this Site is the copyright of ACHRP and its licensors, unless otherwise stated. All rights are reserved. 2. Users are permitted to view, print and download the material for personal, non-commercial and classroom use only but in so doing are not permitted to remove or amend any trademark, copyright or other proprietary notice. Classroom use refers to non-commercial uses by a qualified teacher during a class of students registered in a qualified educational institution (“class-room use”). 3. Users are not entitled to modify the content of this Site or reproduce, republish, distribute, transmit, link, frame or deep-link it on any other website without the express permission of ACHRP. Users may not distribute, transmit, reproduce or publish by electronic or any other means any part of the data or any material generated by or through the site without the prior written permission of ACHRP. Users may not create a database in electronic or structured manual form by systematically downloading and storing all or any of the content. All other rights reserved. 4. All trademarks used on this Site are the property of their respective owners. 'Academy of Certified Human Resource Professionals Limited' and 'ACHRP’ are all trademarks of the Academy of Certified Human Resource Professionals Limited. 5. The use of any trademark on our Site does not imply any affiliation with or endorsement of our Site by such owners. 1. Please refer to the Purchase Terms and Tax Information for the terms, conditions and policies applicable to your purchase of any products, subscriptions or services from our affiliated entities or us. A link to them will appear when you start the ordering process. 2. By ordering products or services through the Site, you agree to be bound by and accept the Purchase Terms and Tax Information. The Purchase Terms and Tax Information are subject to change from time to time in our (or our affiliated entities') sole discretion so you should review them each time you make a purchase. 1. When you register for any services offered on the Site requiring registration, you are asked to provide specific information as set out in the registration form (“Registration Details”). You must provide accurate Registration Details and update your Registration Details as necessary so that they maintain their accuracy. You must keep your password and identification details secure. 2. You are fully responsible for all use of your account and for any actions that take place using your account. 3. You must not allow others to use your Registration Details or account, and you are solely responsible for maintaining the confidentiality and security of your account. You agree to notify ACHRP immediately of any unauthorized use of your Registration Details or account. ACHRP will not be liable for any losses arising out of the unauthorized use of your Registration Details and/or account and you agree to indemnify and hold harmless ACHRP or any associated companies, agents, affiliates and/or licensors, as applicable, for unauthorized uses of your account. 1. All users are responsible for maintaining the security and integrity of the learning materials and Certificates of Participation accessed through this Site or any related online service. 2. Authorization to download a secure Certificate of Participation from the Learning Management System is granted to a User who is enrolled for an approved training course, physically participates in training and signs the Learners’ Attendance Report at the venue. 3. Failure to abide by the above guideline, improper use of such certificates, including a failure to maintain their security and integrity, may be considered malpractice and lead to the imposition of sanctions against the user and/or individuals. 4. Any confirmed or suspected breaches of Certificates of Participation security must be reported immediately to ACHRP at info@achrp.org. 5. All users are responsible for maintaining the security of their Learning Management System password at all times. 6. 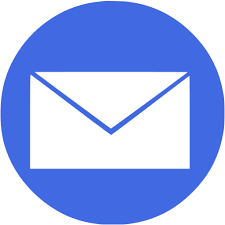 Any unauthorized use of the Learning Management System account by any third party must be reported immediately to ACHRP using the email address above. 1. The Site and all its features, whether or not requiring password registration or payment, is available for your personal, non-commercial use only. You represent and warrant and agree that no materials of any kind submitted to the Site, including if you registered with us through your account, or otherwise posted, transmitted or shared by you will violate or infringe upon the rights of any third party, including copyright, trademark, privacy, publicity or other personal or proprietary rights or contain libelous, defamatory or otherwise harmful material. 2. Taking of courses on the ACHRP Learning Management System is intended for course enrollment, a depository of course learning materials and participation certificates. The user must ensure that for purposes of continuous professional development he/she must participate physically at the registered workshop venue and must sign the attendance register availed by ACHRP agents and or trainers at the training venue. 3. You may not use the Site or any of its features for any illegal or unauthorized purpose. You agree to abide by all applicable local, county, national and international laws and regulations and are solely responsible for all your acts or omissions and for all those that occur under your account. 4. By submitting any material to us you agree to abide by the following rules. ACHRP reserves the right but does not have an obligation to monitor materials or any information which is posted on any part of the Site, any bulletin boards, discussion forums or any tools available on the Site allowing you to post comments, material, views, reviews or comment on material posted by you, us or others or to interact with others or materials in any way (“the Interactive Areas”) and on any part of the Site requiring registration or subscription allowing you to do any of the above. 5. We also have the right, but no obligation, at any time to delete, remove, or suspend the whole or any part of the materials on this Site or any content posted on them including in any Interactive Areas and areas requiring registration or subscription without notice and without incurring any liability. No part of our Site is meant for you to post third-party copyrighted content. That includes the Interactive Areas including those requiring registration and/or subscription. And it means third party copyright content such as songs, film clips, an episode of a TV programme, parts of books, news articles, illustrations, photos or music videos. 6. If you find objectionable or offensive material, please let us know as soon as possible via the report abuse button or by emailing info@achrp.org. 7. The views, statements and opinions expressed in any of the Interactive Areas in any form are those of the individual contributors or advertisers and not the statements and opinions of ACHRP or its affiliated entities. 8. By posting your comments or materials on the Interactive Areas, you grant us and our affiliated entities a non-exclusive, perpetual, irrevocable, royalty-free, world-wide license to use, reproduce, modify, adapt, translate, publish, make available, distribute, include in other works, sub-license and display any content you submit to us in any format now known or later developed. By submitting material, you acknowledge that you waive any moral rights you may have in it. 9. If you do not want to grant us these rights, please do not submit your comments or materials to us. p) Reformat or frame any portion of the web pages that are part of the site, deep link into it without permission. 11. Please bear in mind that we will identify you with content you submitted and may release that information to a court or other official if ordered to do so. 12. We may refuse to grant you a username that impersonates someone else, is or may be protected by trademark or other intellectual property rights, is vulgar, offensive or otherwise inappropriate, as determined by us in our sole discretion. 13. We do not undertake to keep or make available any material that you or anyone else has contributed to the Site for any length of time or at all. We may delete, archive, make unavailable, modify or comment on any material, and close or suspend any discussion topic at any time without notice. 14. You may not use the words “Academy of Certified Human Resource Professionals Limited”, “ACHRP” or any other trademark used on the Site or belonging to us or our affiliated entities, in particular in any meta-tags or other “hidden text”, in each case without our express prior written consent. 1. You are solely responsible for your interactions with other users of the Site. 2. We reserve the right, but have no obligation, to monitor disputes between you and other users. 1. Although we try to ensure that the information we provide on this Site is correct, it is provided on an 'as is' basis, without warranties of any kind. No warranty, express or implied, is given that any of the content of this Site is accurate, complete or up to date. ACHRP does not accept any liability for any error or omission of any content on this Site, including content provided by any affiliated entities or us or by any users or other third parties. 2. Any representations and warranties whether express or implied, including implied warranties of merchantability, fitness for a particular purpose or non-infringement, whether implied by statute, common law, custom, trade usage, course of dealing or otherwise are excluded to the fullest extent permitted by law. We do not exclude any liability in respect of death or personal injury caused by our negligence, liability for our fraud, or any other liability that we cannot exclude by law. 3. We cannot guarantee and do not promise any specific results from use of the Site. 4. Use of this Site and any content on any part of it whether requiring registration and/or subscription or not is at your own risk. ACHRP will not be liable to any users of this Site (whether registered users, subscribers or not) and any third parties for any claims or losses of any nature including, but not limited to, loss of profits, direct, indirect, special or consequential damages arising from a user’s or third party's use or inability to use this Site or any part of it, including any loss of data or lost profits or wasted time of management or employees even if ACHRP is aware of or has been advised of the possibility of such damages. Notwithstanding anything to the contrary contained herein, ACHRP’s liability to you for any cause whatsoever, and regardless of the form of the action, will at all times be limited to the amount paid, if any, by you to us. 5. ACHRP accepts no responsibility for the content on any website to which a hypertext link from this Site exists or for any use of personal data by the third party operating such a website. 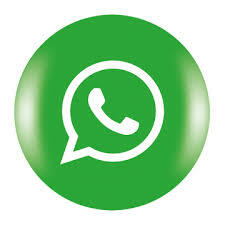 The links are provided 'as is' with no warranty, express or implied, for the information provided within them. 6. All authors or providers of a link into this Site should note that ACHRP does not necessarily read, check or edit the content from such links and ACHRP accepts such material linked to its Site purely on the basis of an understanding that ACHRP is a distributor (not a publisher) of such material and by linking to this Site, the author or provider of the link gives an implied warranty that he/she/it will indemnify ACHRP in the event of any action arising as a result of such material appearing on or via this Site. All persons accessing this Site are also put on notice of such fact. 7. While ACHRP makes all reasonable attempts to exclude viruses or other code with contaminating or disruptive properties from the Site, it cannot ensure such exclusion and no liability is accepted for viruses and any computer code/software. You are recommended to take all appropriate safeguards before downloading information from this Site. 8. Information transmitted via this Site will pass over public telecommunications networks. ACHRP makes no representation or warranty that the operation of this Site will be uninterrupted or error free and disclaims all liability in this respect. The Site may be temporarily unavailable from time to time for maintenance or other reasons. 1. You agree to hold harmless, indemnify and at our request defend, ACHRP, its parents, subsidiaries and other affiliated entities and their respective owners, officers, managers, agents and employees from and against any third party claim arising from or in any way related to your material, your use of, conduct on the Site, including any liability or expense arising from all claims, liabilities, losses, damages (actual and consequential), suits, judgments, litigation costs, expenses and lawyers fees, for every kind and nature. 2. In such a case, we will provide you with written notice of such claim, suit or action to the address you registered with us. 1. ACHRP may immediately suspend or terminate your access to the Site without notice if any breach of these Terms and Conditions of use by you is brought to our attention. 2. If you breach these Terms and Conditions and we take no action, we will not be deemed to have waived any of our rights and may still use any rights and remedies that were open to us when you broke them. 3. Your registration may be terminated and your profile and any content or information that you have posted on the Site may be deleted at any time. We may prohibit you from using or accessing the Site for any reason, at any time in our sole discretion, with or without notice. These Terms and Conditions shall apply to any use of the Site, also after your registration was terminated. 4. We reserve the right to deactivate user accounts and user names that have been inactive for more than 180 consecutive calendar days. 1. By visiting or using the Site you agree that these Terms and Conditions are governed by and shall be interpreted in accordance with Kenya law. The courts of Kenya have exclusive jurisdiction over any dispute between you and us, irrespective of whether or not you are a registered user/subscriber and irrespective of the type of dispute. You agree not to commence or prosecute any action against us other than in the courts of Kenya and you hereby consent to, and waive all defenses of lack of personal jurisdiction and forum nonconventions with respect to, venue and jurisdiction of the courts of Kenya. Notwithstanding this, you agree that we shall still be allowed to apply for injunctive remedies (or an equivalent type of urgent legal relief) in any jurisdiction. 2. ACHRP makes efforts to ensure that its publications, advertising and offers on this Site fully meet the requirements of Kenyan law and foreign laws of any country where it is intended for such content to be viewed. In the event that a foreign country's law may not be fully complied with, then ACHRP shall be deemed not to be directing such content to that particular country. 4. 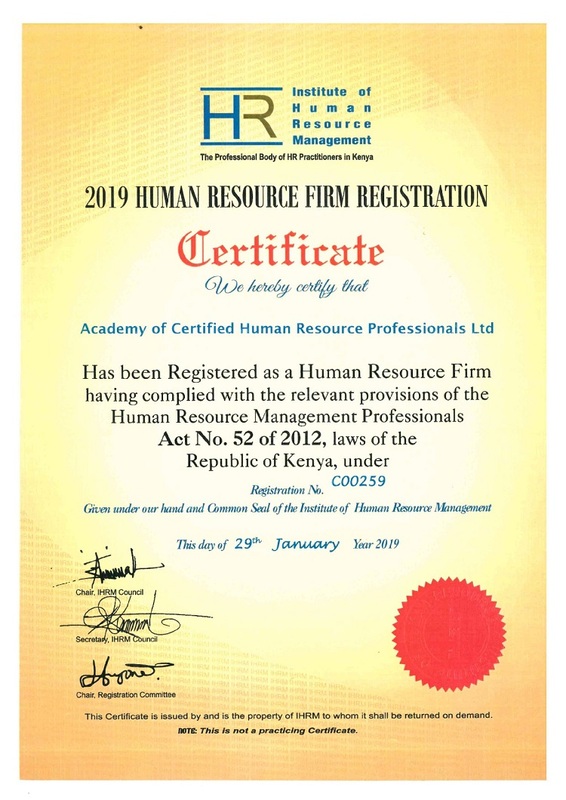 The Academy of Certified Human Resource Professionals Limited is a registered company in Kenya whose office is at 17th Floor, Regus Suites, ICEA Building, Kenyatta Avenue, Nairobi and company Registration No. PVT/2016/032187, Taxpayer PIN No. P051626725K, IHRM HR Firm Registration No. C00259 and NITA Approved Trainer Registration No. NITA/TRN/1234. Don't have an account, register here? I have an account, Sign In here? ©2016 –2019 ACHRP. All rights reserved. ©2016 –2019 Academy of Certified Human Resource Professionals Limited. All rights reserved.